Yes, another trip up island towards Courtenay meant a visit to Fanny Bay. Although the friends I was with arrived 15 minutes late to have lunch at Happy Hen’s Café, the operation that runs within Fanny Bay Service, the advice of the staff at this stop led us to Fanny Bay Inn, and we were not disappointed. Since this township is famous for their oysters far and wide, I was considering an all oyster meal. But before I could finally decide on what to eat, I was served with a cola delivered with class. I do not often find bars that serve it with a lime wedge. That helps cut the acidity down in the pop, and it is a trick not many operations consider doing. When it came time to order, I had to start with Naked Oysters (6/$10.95), their tongue-in-cheek name for raw on the half-shell. There was a pineapple basil salsa that I think is delicately divine. It could have been turned into a salad in itself because of all the colours that I could see. The peppers were very sweetly crisp, and the combination of olive oil and basil really made my taste buds do the happy hula. I used it sparingly than to spoil the true taste of this mollusk. It’s very mild in its briny taste, and people with refined taste buds can notice the cucumber like aftertaste. My friends and I agreed that going to Fanny Bay Inn will have to become a regular stop more so than hitting the other place up. When considering the menu differences between the Inn and the Happy Hen, I’m sold to coming here instead. On the menu are variants. 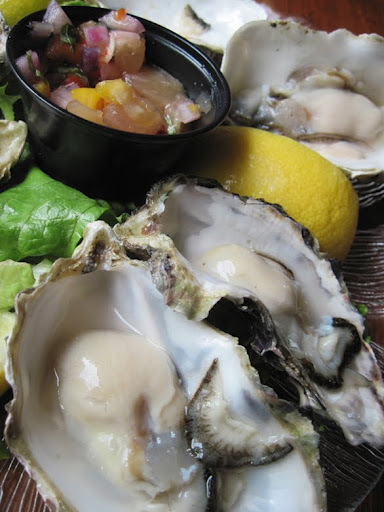 Happy oyster connoisseurs can enjoy a fanny bay with Tequila, Thai sesame dressing or a ginger lime relish. But to be fair to this mollusk, I had to try it cooked too. At $11.50 for six, the price was just right. Lightly breaded and pan-fried, they tasted better with the basil salsa on top. With a side of pickled onions, I was impressed. And they were far less greasy than in how Happy Hen’s cooked theirs. If I had to choose between the two, I’d go to the Inn and sit down to eat. The bonus is that there are more seats. The ambiance is really quiet here. During the day, I’m sure that’s to be expected. At night, I’m sure it’s very spirited. Seafood aside, I have to say the real highlight of my late lunch is not with the oysters. 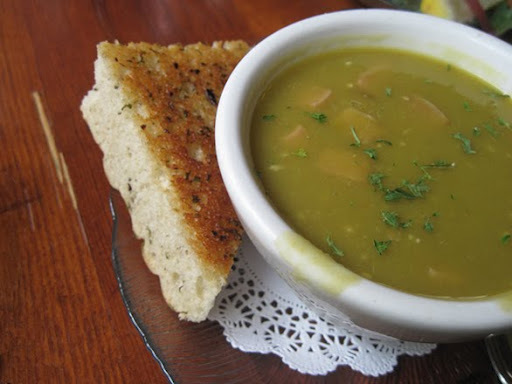 It was with the soup of the day ($3.75), a killer lentil and ham soup. With the cornbread I had on the side to add extra weight, I found the combination very warm and inviting. It’s a meal that delivers warm and fuzzy feelings all over my body. It’s a perfect meal to sip on for those chilly nights by the sea. At Fanny Bay, one can delight to watching trollers and a sinking sun with the full knowledge that the entire beach is ripe for the picking with all its delicious oysters. This entry was posted in Uncategorized and tagged Dinner, Fanny Bay, Lunch, Pub Food, Seafood. Bookmark the permalink.